Mario Rizzi, Al Intithar (The Waiting), 2013, color, sound, 30 minutes. For more than a decade, Mario Rizzi, a photographer and filmmaker attuned to sociopolitical changes in the Islamic world, has been investigating the fates of individuals and communities uprooted from their cultural traditions and homes by regional conflicts. Al Intithar (The Waiting), 2013, the first part of his trilogy Bayt (Home), 2012–, is a thirty-minute film at the center of this exhibition. 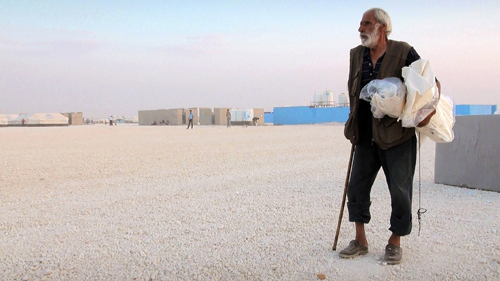 It was shot in the Zaatari refugee camp in Jordan, just four miles from the Syrian border. At the time, the camp accommodated approximately forty-five thousand refugees (the number is now around eighty thousand) who were besieged by both the Syrian government and opposition forces. Surrounded by Jordanian tanks, the camp is an immense agglomeration of tents and containers in the desert, pounded by sudden sandstorms. Those in the camp cannot leave except with a permit or by fleeing, with the hope that some foreign country will welcome them. Al Intithar focuses on the daily life of a young widow from Homs and her three children; it is through her that Rizzi examines the camp’s collective existence, despite desperate conditions. The women perform the usual caretaking, cooking, and cleaning; they maintain relationships and even arrange marriages via cell phone with families who have remained in Syria. The men, feeling useless, are troubled and want to get out and fight. In the outdoor shots, Rizzi gives these people an almost monumental dignity amid the dusty whiteness of their surroundings, while in the close-ups of interiors, he discreetly approaches a world characterized by renunciation and sacrifice but also affection and bonds. Choosing a nonlinear narration style and allowing personalities to emerge from conversations and relationships, Rizzi conveys a state of mind that the refugees share: the maintenance of the family core as a foundation of identity that enables survival amid displacement. Bearing witness to how the concepts of belonging and home can be affirmed where boundaries have been annulled or redrawn by wars, Rizzi, with his empathic gaze, observes the birth of a new social model of coexistence—the cosmopolises of the refugee camps—from which a new generation is emerging that will lay claim to the history of its native land.